Hugo Oliveira is currently a staff researcher at INL. His research is focused on the development of analytical solutions based of integrated optical sensors for application in agriculture and environmental fields. Hugo Oliveira graduated in Pharmaceutical Sciences from the University of Porto in 2003. He completed his MSc in Environmental Analytical Chemistry in 2005, in a joint program between University of Porto and University of Aberdeen (UK). In 2010, Hugo received his European PhD degree in Analytical Chemistry by the University of Porto, which consisted on the development of automatic sample preparation protocols for liquid chromatography, applied to food and environmental analysis. After the end of his PhD, Hugo integrated the trace metals team from the University of Hawaii that took part in the research cruise CLIVAR S4P in Antarctica, dedicated to climate variability. 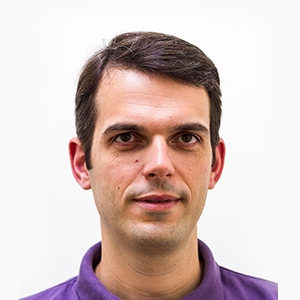 Before joining INL, he was a post-doctoral fellow at REQUIMTE (University of Porto), where his research comprised the development of analytical methodologies for environmental and feedstuff monitoring, with an emphasis on (bio)chemical markers of methane emission of ruminants. I.M. Valente, H.M. Oliveira, C.D. Vaz, R.M. Ramos, A.J.M. Fonseca, A.R.J. Cabrita, J.A. Rodrigues. Determination of ammonia nitrogen in solid and liquid high-complex matrices using one-step gas-diffusion microextraction and fluorimetric detection. M.R.G. Maia, S. Marques, A.R.J. Cabrita, R.J. Wallace, G. Thompson, A.J.M. Fonseca, H.M. Oliveira. Simple and versatile turbidimetric monitoring of bacterial growth in liquid cultures using a customized 3D printed culture tube holder and a miniaturized spectrophotometer: Application to facultative and strictly anaerobic bacteria. Frontiers in Microbiology 7(AUG) (2016). H.M. Oliveira, M. Grand, J. Ruzicka, C. Measures. Towards chemiluminescence detection in micro-sequential injection lab-on-valve format: A proof of concept based on the reaction between Fe(II) and luminol in seawater. M. Grand, H. M. Oliveira, J. Ruzicka, C. Measures. Determination of dissolved zinc in seawater using micro-Sequential Injection lab-on-valve with fluorescence detection. H. M. Oliveira, M. A. Segundo, J. L. F. C. Lima, M. Miró, V. Cerdà. On-line renewable solid phase extraction hyphenated to liquid chromatography for the determination of UV filters using bead injection and multisyringe-lab-on-valve approach. Journal of Chromatography A, 1217, 3575-3582 (2010).